UbaPesa app has joined the now fast growing mobile app loan business in Kenya. It however comes with a different approach which involves allowing peers to lend money to borrowers instead of only allowing taking of loans which is what many mobile loan apps like Branch, Timiza e.t.c do. You can use Ubapesa App to lend money to people within a short period of time and get paid back with interest or you can take a loan with UbePesa and repay with interest. 2 How does UbaPesa App work? 3 Where can I download UbaPesa App? UbaPesa Limited is a money lending app that is increasingly becoming famous in Kenya. 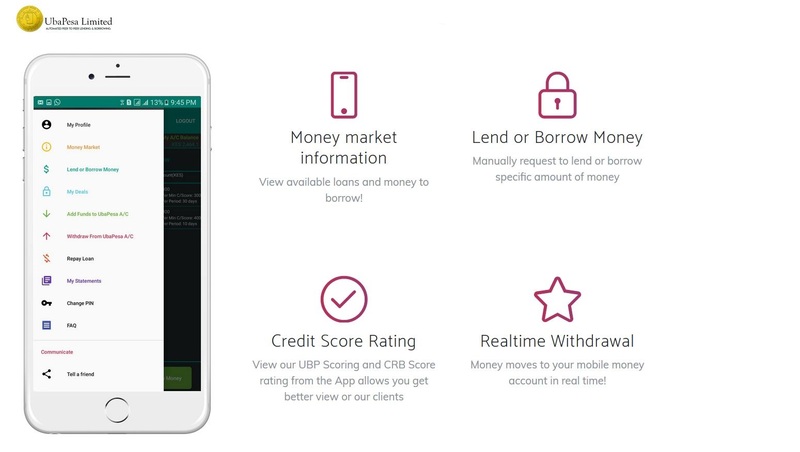 Founded by a Nairobi based company, the app connects lenders and borrowers enabling them to save money or borrow from each other. According to a recent report by the Financial Sector Deepening (FSD), an estimated 35% of Kenyan adults are using mobile platforms to borrow money. UbaPesa checks the eligibility of an individual to lend money through their M-PESA account. Unlike other money lending apps ubapesa not only creates a CRB account for individuals wishing to borrow money but it also has a money back guarantee to money lenders. How does UbaPesa App work? To borrow or save money from UbaPesa, you first have to download the app and install it on your phone. You will then have to create an account and register it with your M-PESA number. If you intend to save money and lend it to borrowers, proceed and load your account with money. If you intend to borrow money, you can also do so. If you intend to lend money to borrowers, you will have to further select the minimum credit score you intend to lend, the select the lending option, repayment method and finally submit. and Just like Uber matches taxis with customers. Ubapesa matches the lender and the borrower hence the name UbaPesa. The facility fees charged by ubapesa vary according to the number of days. The charges are 8%, 9% and 10% for loans of 10 and 30 days accordingly. The platform fees for the ubapesa app are charged at 44.75% and 15% for withholding tax. As a lender, you will get to an 55.25% of the total interest. Where can I download UbaPesa App? Office Location: Golf View Office Suites, along Wambui Road off Thika Road, Muthaiga. Can’t remember my ubapesa pin, can you pls send it to me through sms?